Pricing – Doctor Sprinkler is a professional sprinkler repair company in the Greater Houston area. Doctor Sprinkler is a professional sprinkler repair company in the Greater Houston area. We charge an $95 service call whenever we come to you. The service call covers a through inspection of your sprinkler system. Therefore, before we work on anything we both know what the current state of your sprinkler system. Very often we get a call about something wrong in the front yard and through our inspection process we discover a zone in the back yard is not working. We want to leave your house knowing that we did everything to get your sprinkler system performing as if it was new. We give free advice over the phone. Problem: A zone does not work on a 6 zone system. All the valve boxes are easily visible in the yard. Our pricing is based on the job. Every job consist of a service call charge plus the repair charge. 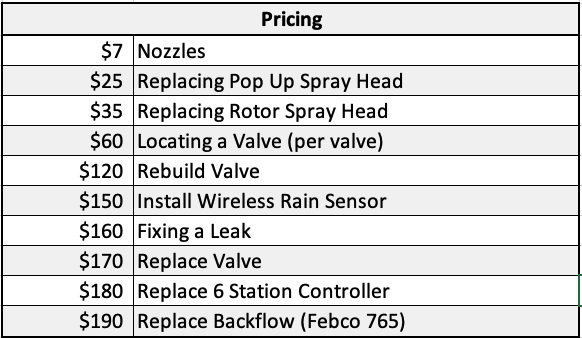 The following pricing are common repairs. * Rainbird 1804 or Hunter Pro-Spray may be substituted. 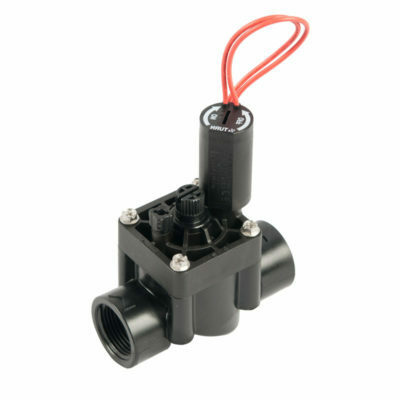 ** Rainbird 5004 will be used unless the original installation used Hunter PGP.